New Mighty Mouse in the works? Signs are pointing towards a brand new Mighty Mouse from Apple, and it is highly likely that this new peripheral will not be any other ordinary mouse. No sir, according to a US patent that was filed by Apple early last year, this new desktop mouse will utilize part of the multi-touch concept that is currently found on the iPhone. This concept will turn the humble mouse into a hand controller of sorts, where an optical sensor integrated within the mouse will be able to map the surface and recognize contact from the user’s hand according to the changes experienced in the image. Read on after the jump for more about the inner workings of this new mouse. The visual information will subsequently be translated to a flat grid in software, whereby the computer will recognize the user’s intent after some processing. This image-based system is great as it eliminates problems associated with the majority of touch sensitivity according to Apple. Not only that, it does not limit touching to a specific area of the mouse but instead covers the entire mouse surface with the ability to recognize multiple fingers simultaneously. This adaptation enables the mouse to recognize both gestures as well as mouse clicks in a cinch. Hmmm I suppose if these new mice had some sort of voice, they’d probably sue us humans for pinching them all over the place just because we can. Jokes aside, this technology offers a greater degree of customization, and could potentially change a user profile by simply recognizing the fingerprints of the user. 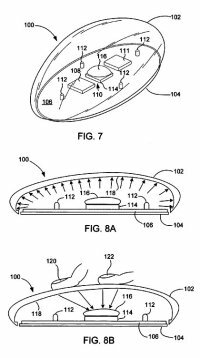 There is no word from Apple as to whether this technology will be implemented in a future mouse but this patent favors unibody mice like Apple’s very own Mighty Mouse. What will they dub this should it actually be released in the future? The iMouse?